Several online reports/surveys have pointed out that kids these days are addicted to smartphones, and I have to agree with that. My nephew, for instance, is always engrossed with his dad’s phone and iPad. Or just take a walk outside and you’ll spot many children doing the same thing as well. I believe no parents would want their kids to always be using these gadgets because it is not healthy and most importantly, it erodes family bonding. 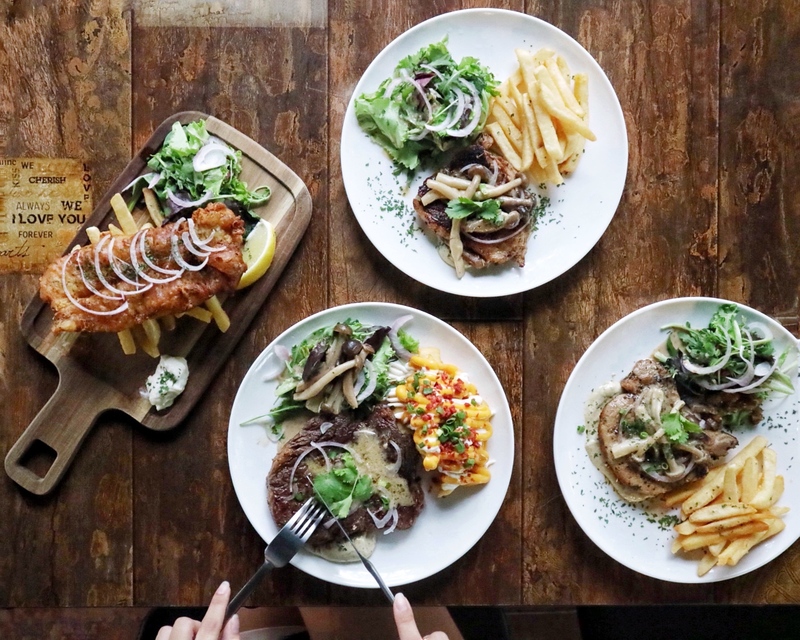 Recently, I found a hidden and humble bistro bar – Eat Talk Drink within Pasir Ris Park that offers a decent range of comforting Western dishes (bar snacks and mains) at an extremely affordable price. The name Eat Talk Drink came about because Ronnie (owner of the bistro bar) hopes to see his diners enjoying their food & drinks while having a good conversation with their loved ones without getting distracted by their phones. On top of that, they are located next to a STABLE which is a great family outdoor activity. To all the young dads out there, you can bond with your loved ones this Father’s Day over horse/pony riding and end off with a memorable meal at the family-friendly Eat Talk Drink (I have everything planned out for you in this article)! For the office people, Eat Talk Drink is also a nice place for you to chill with your colleagues/friends after work (away from the bustling city). Before I show you guys some photos of the place, here’s a picture of what I had at Eat Talk Drink. The dishes they offer are simple, nothing too fanciful but very comforting. I’m in love with their nostalgic Cheese Fries with (vegetarian) Bacon Bits. Also, portion is very generous as well. Eat Talk Drink is located within Pasir Ris Park, surrounded by lush greenery. The bistro bar is actually quite accessible, about 10 minutes away from the main road. Welcome to Eat Talk Drink! Haha! We were very intrigued by the fence! Loving the alfresco area of Eat Talk Drink! I can sit here all day and just watch the world go by. They have a few areas for you to take OOTD and here’s one of my favourite spot (at the front of the bistro bar). So, the restaurant is located next to Gallop Stable! You can bring your family here for a horse/pony ride. Prices are relatively reasonable! The dory was well-battered and fried to perfection – crispy & not too oily. Squeeze some lemon onto the fish and pair it with tartar sauce for maximum pleasure. Kids will definitely love this too! Chicken was well-cooked to achieve a tender and juicy texture. I really liked their in-house mushroom sauce (and look at how big the mushrooms are). Also, the mustard-mayo mix (at the side) was a great condiment. Don’t say I never warn you, the dip is addictive! Pork was handled and cooked well (doesn’t have a strong smell). Stark Reminder: Eat it while it’s hot because it can get a little tough when the dish is cold. Two main focus on this dish: The firm and juicy beef patty and the nostalgic Cheese Fries with Bacon Bits. Again, kids will love this! As you can see from the picture, the beef was well-cooked to achieve a nice medium rare texture. It was tender, flavourful and juicy. Highly recommended! *Father get to enjoy a FREE Drink or FREE Main Course on Father’s Day!